This is another one of those books that I loved but I really wished that I read book 1 first because book 2 blew me out of the water. 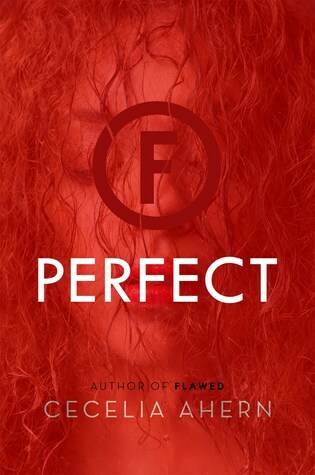 I devoured Perfect. I think I read it in a couple of hours after my kids went to bed for the night and when I was done with it, I closed the book and just stared out into space….trying to digest everything that I just read. Yes, it was truly that good. Celestine was a reluctant hero of the Flawed. When I say reluctantly because she really didn’t want to be a poster child for anything. All she wanted to do, at first, was to just find a place that she could go off grid and hide from Craven and his Whistleblowers. But that just doesn’t happen. Any place that she finds sanctuary in, they always show up. I kept thinking that maybe she had a tracking device or something on her at one point because of how they would always show up. But it was revealed, in most of the cases, that fellow Flawed were calling the Whistleblowers and altering them to where she was. Which was kind of crappy, in my eyes. I couldn’t stand Craven. He was gunning for Celestine because he thought that she had incriminating video evidence that shows him illegally branding Celestine on the spine without numbing the area first. Then he tries to cover up his crime (because it was a crime) by kidnapping everyone that was there or saw her brand. Like that was going to help everything. And when he does finally get Celestine, what does he do….arranges for her to have a skin graft to cover her brand. Any scene with him in it made me feel seriously greasy and I wanted to shower. I wasn’t too sure about Carrick at first. Everything he did for and with Celestine ended up serving himself or the political party that he has become attached to. I even began to question if he was really attracted to her or if it was a ruse to get her to join him and help the political party. But, like everything else in this book, not everything is what it seems. Again, I do wish that I had read book 1. I had a small issue with the significance to where the people were branded. It wasn’t clearly explained in Perfect and that drove me nuts. But it didn’t take away from the story. Just personally drove me nuts. The end of the book was pretty intense, action wise and I did like that all the storylines were brought together and ended. Why: Like I said above, I devoured this book in 2 hours. The plotline was great, characters were memorable and I loved the twist at the end of the book.